With two high demand show exclusives on the floor and a giant Pinkie Pie on the floor, My Little Pony is a major force at San Diego Comic-Con this year. Will Hasbro use this power for good, or for evil? I suppose that all depends on who you ask. As I attempted to take a picture of the giant Pinkie Pie (below, the pink one) all sorts of people got in my way. Little girls getting their pictures taken by their parents, teenage boys posing for their friends, and yeah, some fully grown men and women who just love the show for its uplifting humor and warmth. The common thread was that everyone that passed the pink plastic pony treated her with respect. No one was poking fun. No one was accusing Hasbro of forcing pony content on them. No one tried to feel her up, as far as I know, anyway. My Little Pony t-shirts abound, I'm sure I've seen MLP cosplay amongst the crush of fans on the show floor. It's a pony show, and Hasbro's got the show ponies on the floor. 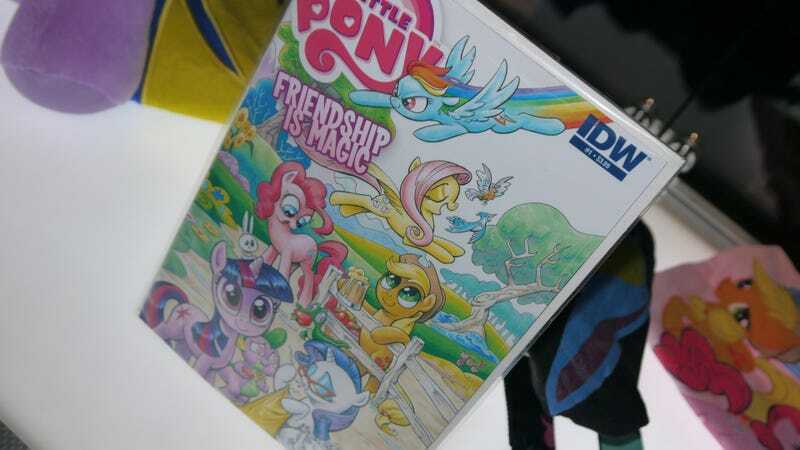 So here's a quick sampling of what Hasbro brought to Comic-Con from their stable of My Little Pony merchandise. I'm off the worship at the altar of Tara Strong.